Your grandmother always said that high purity omega-3 oil was “brain food”. Now we are discovering more of the molecular mechanisms that are making grandma's wisdom from yesteryear into today's molecular biology breakthroughs. The newest study that validates grandma's wisdom will be reported in an upcoming issue of Nature Neuroscience and demonstrates the devastating impact that a lifetime diet that is deficient in omega-3 fatty acids can have on mood and impaired emotional behavior (1). What enables the brain to make new connections is the endocannabinoid pathway that controls remodeling (i.e. plasticity) of neurons. In particular, the endocannabinoids must interact with their receptors to initiate neuronal remodeling. Without the adequate dietary intake of omega-3 fatty acids, the animals became far more depressed than their genetically identical cousins. The effect of the omega-3 fatty acid deficiency was not a general effect, but localized in the pre-frontal cortex, the area of the brain that is implicated in emotional rewards. Both EPA and DHA were depressed in the pre-frontal cortex. In addition, the levels of arachidonic acid (AA) were significantly increased in the same brain region thereby increasing the extent of neuro-inflammation. An earlier study indicated that it only takes one generation of deficiency of omega-3 fatty acids to increase depression and aggression in rats (2). This study also helps to explain why high doses of omega-3 fatty acids improve depression in various clinical studies (3-6). I suspect the mechanism may be the following. The depressed levels of DHA would decrease the fluidity of the neural membrane. This would make it more difficult for the activated endocannabinoid receptor to transmit its signal to the interior of the neuron necessary for the initiation of new neural synthesis. The depression of EPA as well as the increase in AA in the pre-frontal cortex would increase the levels of neuro-inflammation in the brain that would further inhibit the signaling mechanisms necessary to initiate the remodeling of neural tissue. But to be effective, you must take a therapeutic dose of omega-3 fatty acids. That can be best determined by the AA/EPA ratio in the blood (7). This is because the brain doesn't make these long-chain fatty acids, but it can readily take them up from the blood. As usual your grandmother was correct when she called high purity omega-3 oil “brain food”. Her wisdom was in line with epidemiological studies that indicate lowered fish consumption is strongly associated with increased depression (8). Lafourcade M, Larrieu T, Mato S, Duffaud A, Sepers M, Matias I, De Smedt-Peyrusse V, Labrousse VF, Bretillon L, Matute C, Rodriquez-Puertas R, Laye S, and Manzoni OJ. “Nutritional omega-3 deficiency abolishes endocannabinoid-mediated neuronal functions.” Nature Neuroscience doi: 10:1038/nn.2736 (2011). De Mar JC, Ma K, Bell JM, Igarashi M, Greenstein D, and Rapoport SI. “One generation of n-3 polyunsaturated fatty acid deprivation increases depression and aggression test scores in rats.” J Lipid Res 47: 172-180 (2006). Rondanelli M, Giacosa A, Opizzi A, Pelucchi C, La Vecchia C, Montorfano G, Negroni M, Berra B, Politi P, and Rizzo AM. “Effect of omega-3 fatty acids supplementation on depressive symptoms and on health-related quality of life in the treatment of elderly women with depression: a double-blind, placebo-controlled, randomized clinical trial.” J Am Coll Nutr 29: 55-64 (2010). da Silva TM, Munhoz RP, Alvarez C, Naliwaiko K, Kiss A, Andreatini R, and Ferraz AC. “Depression in Parkinson's disease: a double-blind, randomized, placebo-controlled pilot study of omega-3 fatty-acid supplementation.” J Affect Disord 111: 351-359 (2008). Stahl LA, Begg DP, Weisinger RS, and Sinclair AJ. 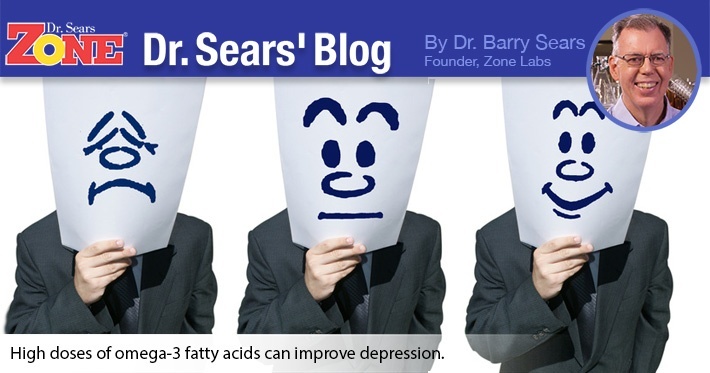 “The role of omega-3 fatty acids in mood disorders. Curr Opin Investig Drugs 9: 57-64 (2008). Stoll AL, Severus WE, Freeman MP, Rueter S, Zboyan HA, Diamond E, Cress KK, and Marangell LB. “Omega 3 fatty acids in bipolar disorder: a preliminary double-blind, placebo-controlled trial.” Arch Gen Psychiatry 56: 407-412 (1999). Adams PB, Lawson S, Sanigorski A, and Sinclair AJ. “Arachidonic acid to eicosapentaenoic acid ratio in blood correlates positively with clinical symptoms of depression.” Lipids 31: S157-161 (1996). Hibbeln JR. “Fish consumption and major depression.” Lancet 351: 1213 (1998).